The Last Days of Midgard comes to an end in this epic conclusion of the five part series. The previous issue may not have been the best, but this issue totally makes up for it. The final battles between Modern Thor and the Minotaur, and King Thor and Galactus take place in this issue, and each one is nothing less than badass. Nearly every single page is full of non-stop action. Modern Thor attempts to save Broxton by battling The Minotaur and Ulik the troll. 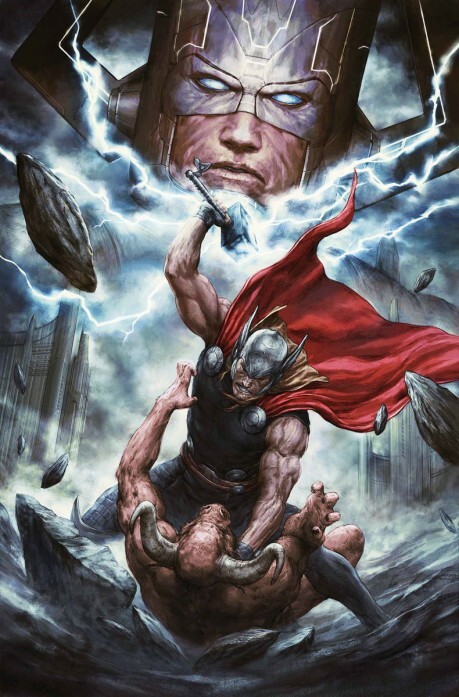 Thor resorts to flying through an explosion, igniting Mjolnir and himself to take down The Minotaur and the trolls. Even the anti-violent Roz ends up killing multiple trolls herself. The more epic of the two storylines is definitely the battle between King Thor and Galactus. 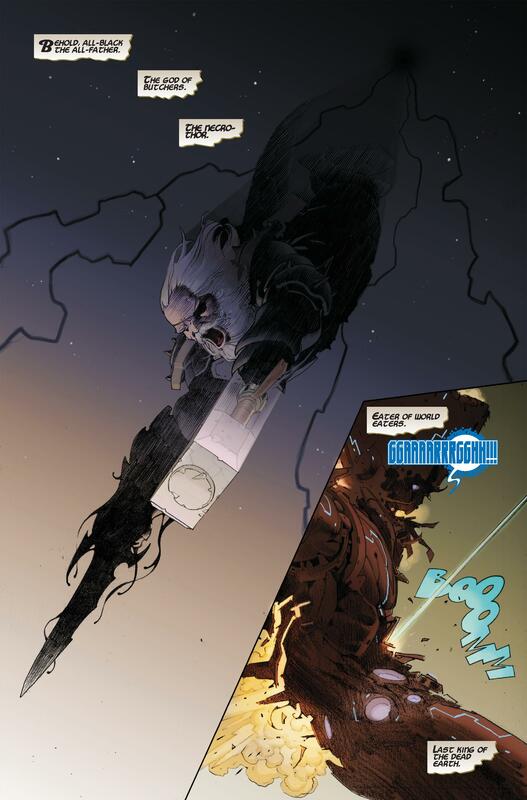 King Thor decides to make one final blow against Galactus by obtaining the God Butcher’s weapon, All-Black the Necro-Sword. By wielding this weapon, Thor has unmatched power, becoming The Necro-Thor. 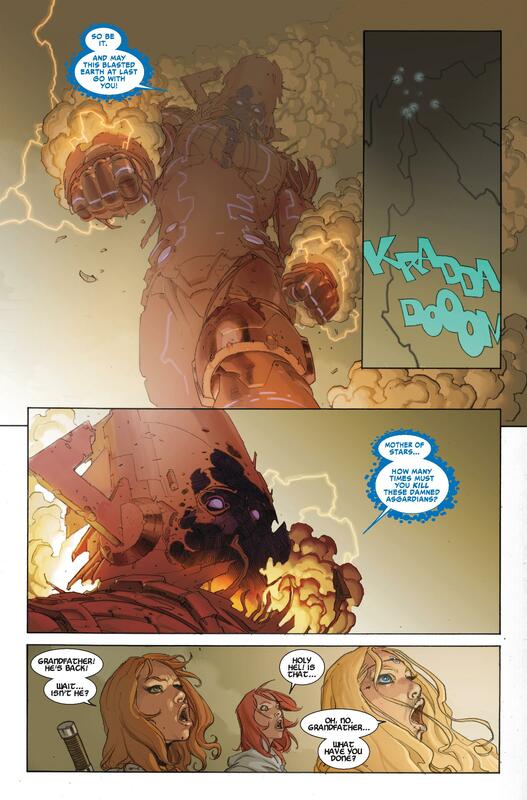 With his new weapon, King Thor kills Galactus by literally blasting his face off with the combined power of the Necro-Sword and Mjolnir. Each story has a completely different ending as well, with the King Thor ending being happier than the Modern Thor’s. After defeating The Minotaur and the trolls, Modern Thor finds that his beloved town of Broxton lies in ruins after the intense battle. Writer Jason Aaron even explains that Thor weeps after seeing what he has done to the town. The ending for King Thor ends on a brighter note when King Thor discovers that his own dripping blood is giving life back to the dead rock that Earth once was. King Thor then makes a vow to preserve the Earth for the rest of its existence. This issue was a fantastic conclusion to a series that had rough beginnings. The next issue will cover a new storyline explaining the fate of Broxton, which I am very excited to get my hands on after reading this comic. 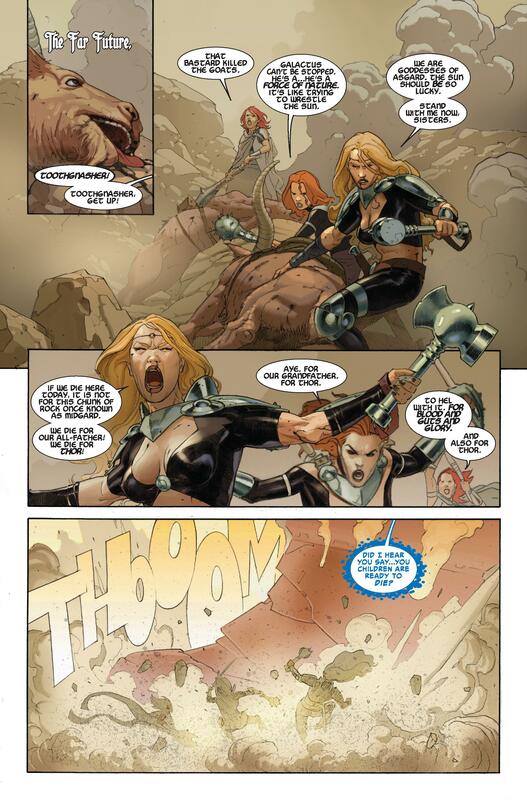 The art style by Esad Ribic was also a nice touch to this comic as well. I highlyrecommend this issue. Thor returns in this issue to put a stop to Galactus, Roxxon Corp., and now trolls.